Take a leisurely cycle through stunning scenery, coastal boardwalks, swing bridges, quaint villages, peaceful valleys. The Great Taste Trail starts at the Kiwi Journeys depot located right beside the i-SITE in Nelson City. You may also start at the Nelson Airport or any point that suits your itinerary or time frame. 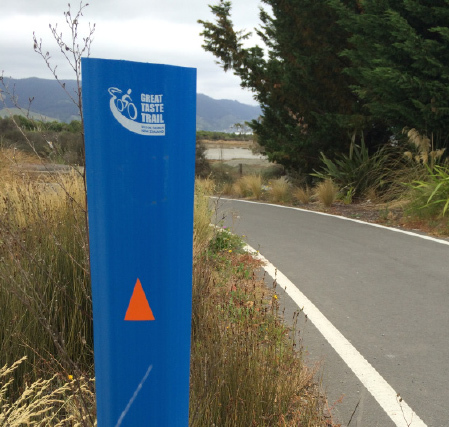 Trail Journeys have three convenient locations in Nelson, Mapua Wharf and Kaiteriteri which makes it really easy for you to rent a bike or jump on or off the Trail Hopper bus and explore any part of the amazing coastal section. The Trail is made up of three stunning sections which are all very different, the Rail route, Coastal route and Valley route. It has predominantly easy gradients with the odd intermediate grade. It is perfect for families and people of different fitness levels. You can enjoy cycling all year round in the sunny climate's of the Nelson and Tasman regions. Did you know: The Kiwi Journeys admin team can package up your accommodation, along with transport, bag transfer, activities etc. This is a free service! For example, it will cost you the same amount to organise your own tour, as it would for us to do it for you. All you have to do is get yourself to Nelson and we will take care of your hassle free itinerary. in the southern hemisphere is an experience you don’t want to miss! On some parts of the trail you will find painted logos like these to show you are on the right track. Much of the trail is shared with walkers so please be aware of others using the trail at all times. Some parts of the trail have bollards which indicate directions to interests and attractions. All along the track are many great quality places to stay and enjoy the area. All itinerary planning and booking comes with the package. We take care of all these details for you. Along with this there are some great places to enjoy a top class meal too! Trail Journeys will package up your accommodation, along with transport, bag transfer, activities etc. This is a free service! For example, it will cost you the same amount to organise your tour, as it would for us to do it for you. The region has a great reputation for the aromatic varieties – Riesling, Pinot Gris and Gewürztraminer, and their own distinctive take on Sauvignon Blanc, some exquisite examples of Chardonnay and Pinot Noir, and some superb "stickies". Nelson wines are sold around the world, but you have the chance to experience our wines in the place they are created.